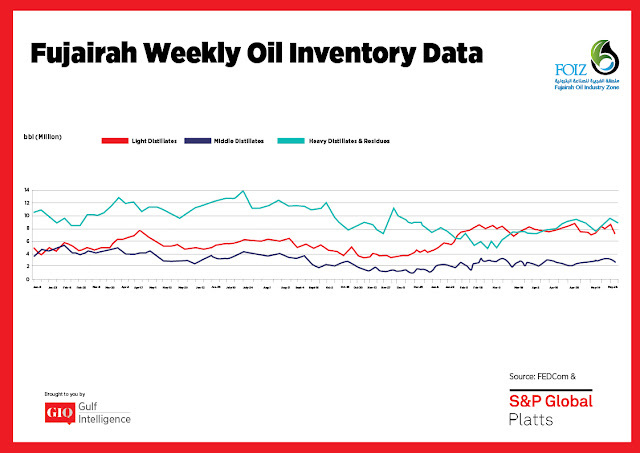 Oil product stocks in the Middle East's key oil hub of Fujairah fell 13.4% in the week to Monday, as inventory levels declined across all report categories. Total oil product stocks in Fujairah were 16.776 million barrels, down 2.6 million barrels from a week earlier, according to data from the Fujairah Energy Data Committee, or FEDCom. 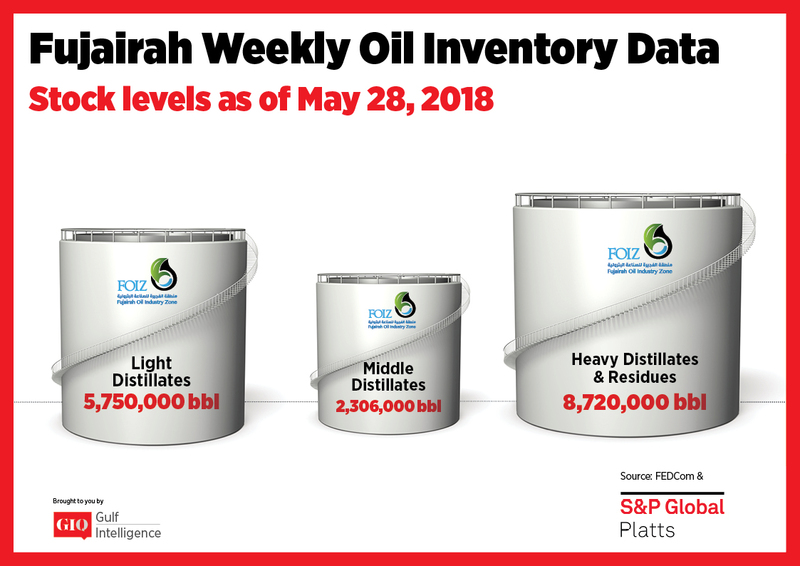 The biggest change was in light distillates, which dropped by nearly a quarter over the week to 5.750 million barrels, the lowest so far this year, as both the Middle East and Asia have rising gasoline demand over the Ramadan season, S&P Global Platts Analytics said in a report Wednesday. Kuwait's KPC continues to seek additional spot volumes and this week issued a tender for 100,000 mt of RON 91 gasoline over June and July. There has also been a shift in demand towards lower RON gasoline, a Middle Eastern trader said. Premiums for Arab Gulf RON 95 gasoline were almost unchanged on the week at $3.10/b on Tuesday. Stocks of middle distillates fell 13.7% to 2.306 million barrels. But they remain rangebound and have not risen above 3 million barrels since September 11, 2017. 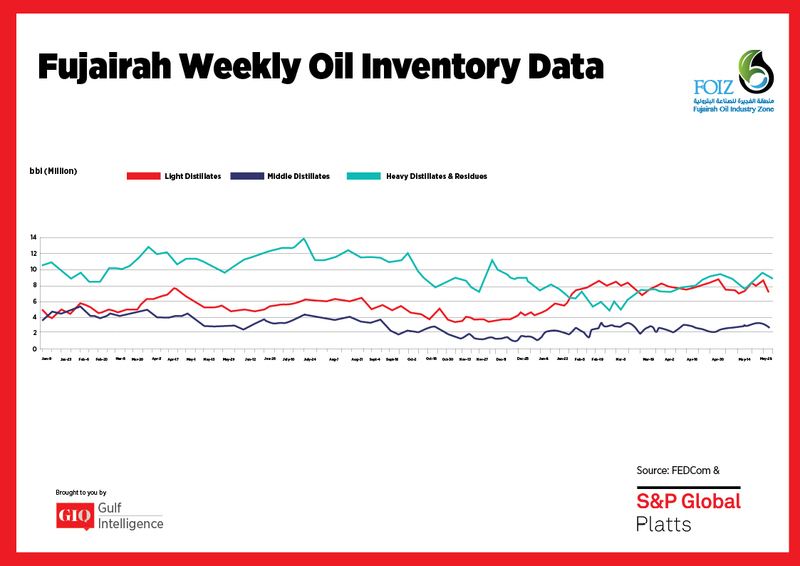 The East of Suez market is broadly balanced, but some say supply could begin to outstrip demand as refinery runs rise to peak summer levels in coming weeks, Platts Analytics said. For now, a tighter supply of gasoil in Europe is attracting Middle Eastern barrels, with the East-West exchange-for-swaps recently at its widest in six weeks. East African demand has also been strong, with sources noting recent vessel shipments from Fujairah to Tanzania, the report said. Stocks of heavy distillates and residues fell 5.2% to 8.72 million barrels. Strategically located outside the Strait of Hormuz chokepoint, Fujairah has not only become the world's second largest bunkering port but is increasingly an important hub for trading and storage. But bunker activity in Fujairah has been limited this week due to holidays in the US, Europe, and Singapore, although sentiment has firmed recently. Bunker prices have followed crude prices retreating from the $80/b Brent futures level last week to just above $75/b Tuesday. This should be positive for bunker demand, adding to seasonal power sector demand over the summer, Platts Analytics said.